Peers Keep It Real: This research project examined a peer-facilitated behavioral intervention for adults who had fallen out of HIV care and had experienced repeated challenges taking life-saving HIV medications faithfully. 2013-2017, funded by National Institute Nursing Research/NIH. Addressing hypertension in the bateyes of the Dominican Republic: This participatory research project is examining the sustainability of a model for chronic disease management among adults with hypertension (high blood pressure) in low-income, geographically isolated communities. 2016-2018, funded by the Jonas Philanthropies. Jonas Global Fellows in the Dominican Republic: This program provides global health research experiences for graduate nursing students. 2016-2019, funded by Jonas Philanthropies. Dr. Maithe Enriquez is an adult nurse practitioner and participatory health researcher. 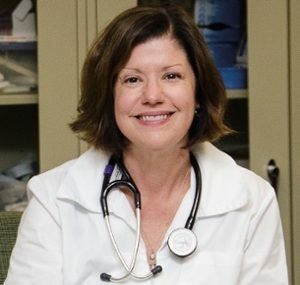 She strives to maintain a program of research and a clinical practice that will make a significant positive impact on the lives of people who are living with or are at risk for chronic health conditions and infectious diseases. The problems that Dr. Enriquez saw in her clinical practice led her to pursue the PhD to conduct research focused on enhancing chronic disease health outcomes, particularly among people who were struggling with HIV treatment. Dr. Enriquez has conducted successful funded studies with underserved, vulnerable populations. Her research focuses on developing practical interventions that can help individuals and communities improve their health outcomes. Bilingual (Spanish/English), bicultural nurse practitioner with Metro Infectious Disease Consultants, dedicated to caring for vulnerable adults who are living with HIV disease. Enriquez, M., Remy, L., O’Connor, J. (2018).CBPR and Nursing: Are You Ready? Western Journal of Nursing Research. 40(9): 1275-1277. Rabbitte, M., Enriquez, M.(2018). The Role of Sexual Health Education in Schools: Review. Journal of School Nursing, January (in press). Remy, L. Enriquez, M. (2018). Behavioral Interventions to Enhance PrEP Uptake Among Black Men Who Have Men with Men: Review. Journal of the Association of Nurses in AIDS Care (in press). McKinsey, D.S., McKinsey J.P., Enriquez, M. (2018).The 1918 Influenza in Missouri: Centennial Remembrance of the Crisis, Parts I & II. Missouri Medicine. 115(3): 183-188. 115(4): 319-324. Maliszewski, G., Enriquez, M., Logan, P. et all (2017). Development and feasibility of a community-partnered nutrition intervention targeting rural migrant communities in the Dominican Republic.” Public Health Nursing. 34(4): 343-347. Enriquez, M.& Conn, V. (2016). Peers as facilitators of medication adherence interventions: a review. Journal of Primary Care and Community Health. 7(1), 44-55. Conn VS, Ruppar TM, Chase JA, Enriquez, M., Cooper PS (2015). Interventions to Improve Medication Adherence in Hypertensive Patients: Systematic Review and Meta-analysis. Current Hypertension Reports. 17(12):94. Enriquez, M., Cheng, A., Banderas, J., Farnan, R., Chertoff, K., Hayes, D., Ortego, G., Moreno, J., Peterson, J., & McKinsey, D. (2015). A Peer-Led HIV Medication Adherence Intervention Targeting Adults Linked to Medical Care but Without a Suppressed Viral Load. Journal International Association of Providers in AIDS Care. 14(5), 441-448. Llanque, S., Enriquez, M., Cheng, A.L., Doty, L., Brotto, M.A., Kelly, P.J., Niedens, M., Caserta, M.S. & Savage, L.M. (2015). The Family Series Workshop: A Community-Based Psychoeducational Intervention. American Journal of Alzheimer’s Disease and other Dementias. doi:10.1177/1533317514568003. Enriquez, M., Farnan, R. & Neville, S. (2013). What experienced HIV-infected lay peer educators working in Midwestern U.S. HIVE medical care settings think about their role and impact on patient care. AIDS Patient Care and STDs. 27(8), 474-480. Enriquez, M., Moormeier, J., & Lafferty, W. (2012). The management of chronic diseases in rural Missouri practices.Missouri Medicine, 109(3), 210-215. Enriquez, M., Kelly, P.J., Cheng, A., Hunter, J. & Mendez, E. (2012). An intervention to address interpersonal violence among Hispanic-American teens. Journal of Immigrant and Minority Health, 14(2), 292-299. Enriquez, M.& McKinsey, D. (2011). Strategies for HIV treatment adherence success at the individual patient level. AIDS research and palliative care. HIV/AIDS Research and Palliative Care, 3, 45-51. Enriquez, M., Cheng, A., Kelly, P.J., Witt, J., Coker A. & Kashubeck-West, S. (2010). Development and feasibility of an HIV and IPV (intimate partner violence) prevention intervention among low-income mothers receiving services in a Missouri daycare center. Violence Against Women, 16(5), 560-578. Enriquez, M., Kelly, P.J., Witt, J., Rodriguez, L., Lopez, N., Smueles, J, Romey, T. & Sweet, D. (2010). Silence is not golden: Invisible Latinas living with HIV in the Midwest. Journal of Immigrant and Minority Health, 12(6), 932-999.